No memes are a way to say "no" in a creative way. There is a range of no meme staples featuring Grumpy Cat, silly dogs, comic characters, an evil villain, and a cranky talent show judge. When you need a satisfying way to express dissent, a no meme is just the thing. What Do No Memes Mean? No memes represent a forceful "no." They're a way to visually express how you feel about a request when words aren't enough. How Are No Memes Used? Most no memes include a picture of a cranky character or animal, though sometimes the creature is laughing or smirking, in the case of "ha ha ha no" or "how about no?" variations. Meaning: Derived from a rage comic, no face, also known as rage face, is here to decline your request or disapprove of your idea. Image: Top panel: dog appearing to laugh. Bottom panel: the dog is looking serious. Meaning: When your request is so outrageous, you get a hearty laugh before a hard no. Text: Wait I got a better idea. How 'bout no? Meaning: A sassy way of saying no, when a simple no isn't sufficient. When you need to say "no," rage face is here to help. Sometimes it's not enough to turn someone down, you've gotta have a nice laugh first. Sometimes you need to mix a little snark with your objection. Dr. Evil—he's just like us. He says "no" with style. 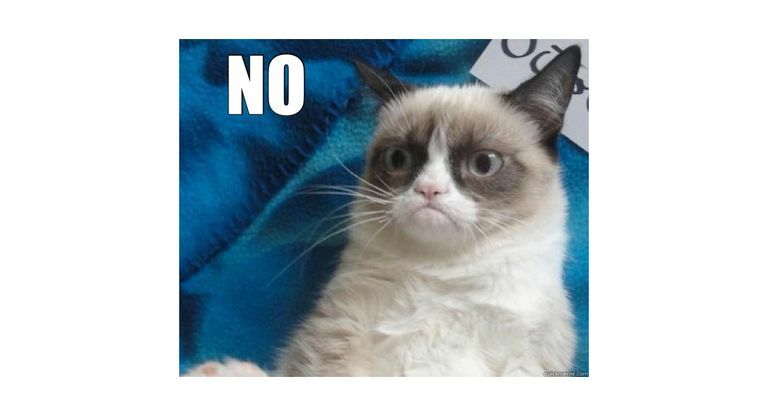 Grumpy Cat is definitely a fan of "no," and in fact, has fifty shades of it. Who can forget how much Simon Cowell enjoyed saying "no" when he was a judge on American Idol? What in the World is a Dank Meme?